WASHINGTON (CNS) — Despite single-digit temperatures, thousands descended on Washington Jan. 22 to declare their opposition to abortion. Most of the red noses and chapped lips belonged to faces under 25. “We are the pro-life generation,” read signs carried by the marchers. The message on the pro-chastity stickers had an extra meaning to those who had experienced travel delays because of the extreme weather. Mary Peters, 16, drove for 11 hours with her classmates from St. Catherine of Siena Academy in Michigan. “It’s amazing to be here with your peers, pepped up about something you believe in,” she said. The participants’ energy was not dimmed by frigid conditions upon arrival. Andrew Redman, 25, from Notre Dame Seminary and Andrew Gutierrez, 20, from St. Joseph’s Seminary came with 10 buses of students from New Orleans. “The snow helped unite us, all huddled together,” Redman said. Logistics may have been part of the reason that March for Life attendees were especially young this year. Kelly Hanlon is the office manager of St. Joseph’s on Capitol Hill, a parish that offers hot chocolate and snacks to shivering marchers. “We only had a few hundred stop by, much fewer than last year,” she said. Though she had met visitors from as far as Canada and Minnesota, many expected groups had had their flights canceled because of the bad weather. According to a 2013 Gallup poll, millennials are the group most likely to believe that abortion should be outlawed in all circumstances, and a majority believed in placing restrictions on abortion. Out of the 56 million abortions since 1973, the millennial generation has suffered the greatest losses. The number of annual abortions reached their peak of 1.6 million in 1990. “Social media has given us the ability to spread the word about causes that are important to us,” she added. 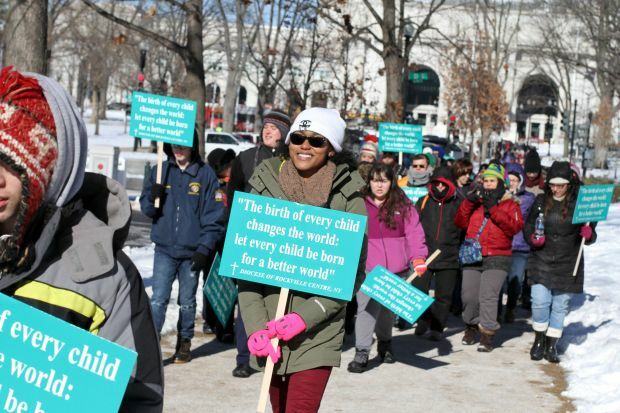 The desire for compassionate understanding was reflected in this year’s theme for the March for Life: “Adoption: A Noble Decision.” Few marchers carried posters depicting graphic abortions, and many simply asked mothers to choose life. Though full of hope for a culture of life, Generation Y activists face challenges on the issue unimagined in years past. It looks like Generation Y is up for the challenge.